Menehunes are the Hawaiian equivalent of leprechauns. Both are diminutive creatures that exist for those who believe in them. The most famous and tallest menehune was Time Magazines' 2001 Person of the Year. See if you can guess his name from the following description: he is a playful elf, pot-bellied, hairy (but not on his head), muscular, and sports bushy eyebrows over large eyes. He stands Democratically, Independently, or Republicanly (depending on the decade) about two feet tall. Due to his short stature, it was not necessary for him to kneel when QE II bestowed honorary knighthood on him in 2002. He hosted SNL in 1997 and made two cameo appearances. He enjoys cliff diving. Hint: The answer is always C.
Menehunes allow only a privileged few to see them. A menehune must give you a special juice which will allow you to see him or her. I have seen menehunes on numerous occasions. What juice did they give me? Wolfgang can sense the presence of menehunes at the door, although he is not juiced up enough to see them. Who is Wolfgang? And finally, the beast of the Pittsburgh Steelers, and my personal favorite player, carries a six inch live menehune as a good luck charm. This very strong Samoan safety ( or very Samoan strong, strong safety) has many off-field interests such as growing flowers, making furniture, playing the piano, and flying on seagulls with a mini-menehune in order to patrol for sharks. Where does Troy Polamalu keep "mini-hune" on game day? I "pau" now. Aloha Oe. 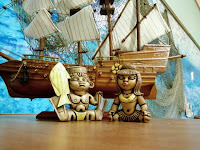 Email any comments, tropical gifts, menehune sightings, menehune pranks, or menehune good deeds to Queen Liliuokalani-Kanela at sandraseeley.com or visit me at Iolani Palace, Hawaii.